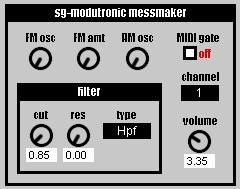 sg-Modutronic Messmaker by Synthgeek is a Virtual Instrument Audio Plugin. 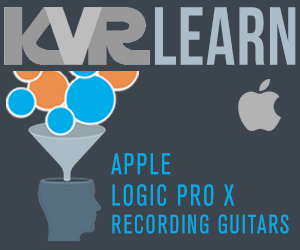 It functions as a VST Plugin. This is a simple synthesizer based on a lo-fi hardware synth of the same name which I built (see my blog for more info). It consists of two squarewave oscillators, and uses both frequency and amplitude modulation to create sounds. The first osc is amplitude-modulated by the second, and the AM output is then fed back to modulate the frequency of the first osc. This software version is different from the original in several ways, the biggest difference being the filter. The rest are down to differences in the implementation of various features/characteristics- in some cases, I did what I could to make it true to the original, in other cases, I left it alone. This means that the software is unable to mimic the sound of the original perfectly, but it can also do things the original can not.